If you follow my YouTube channel or this blog, you’ll see that I like to paint on ceramic tiles. They are easy to find, inexpensive, practical, don’t take much paint and are easy to wipe off and reuse if the results are less than stellar – which often happens. However I have found that in order to actually use them as a trivet or a coaster, I should probably test out some different finishes to see which is the most hardwearing, which is waterproof, heatproof and doesn’t feel ‘tacky’. After having used the Polycryclic varnish on a lot of the tiles, I found that if I stacked them up together they would have a tendency to actually stick to each other just a little bit. A couple of them on the bottom of the pile even got some marks in the varnish where they had stuck to the one above just a little bit. If I was to give them away, sell them even, then I would want to make sure they were going to be actually good to use. No one wants to lift up their coffee cup and find the coaster was stuck to the bottom of the cup! So let’s have a 3-way side by side comparison challenge. 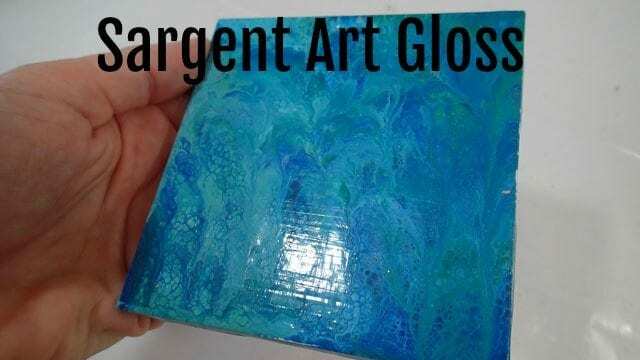 My usual Polycrylic Gloss Varnish, the Sargent Art Acrylic Gloss, and the Mod Podge Dishwasher Safe. These were recommended by other members of the group as a good way to finish the tiles so they would be waterproof and not tacky. Polycrylic – super glossy smooth finish. Easy to use. Doesn’t show brush strokes. Sargent Art Gloss – product can also be used as a medium (more to come on that later). Inexpensive. Glossy finish. 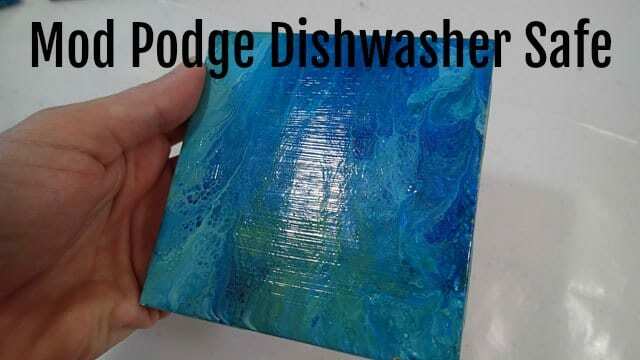 Mod Podge – a more expensive option. Takes 28 days to cure! Said to be dishwasher proof after curing. Difficult to apply, left the most visible brush strokes. Not very glossy. Surface not smooth. In conclusion, none of these were ideal for using a painted tile as a functional coaster for hot drinks. All became tacky and stuck to the hot cup within a couple of minutes. The Mod Podge was the least tacky but even that one quickly stuck to the bottom of the cup and had stuck the worst after the 20 minutes. The ideal solution is no doubt the table top resin which is heat resistant, but that’s expensive and would take your painted tiles into a much higher price bracket if you wanted to sell them as usable tableware. I will continue my search and look forward to your recommendations too. Anyone out there carried out their own testing? Very helpful. I was surprised nothing worked after 28 days of curing. Carry on the good work, Deby. Yes I will keep on trying. I found that Art Resin works quite nicely for coffee cups and is recommended by the company for no temperatures over 115 degrees. I only wish I could afford it! Tacky surfaces has been a dilemma for me as well. I saw where Modge Podge makes a “hard coat” finish for furniture. I may try that one. What about using some kind of shellac? I would like to paint some ceramic tiles and use for a backsplash but want to make sure the paint stays on. I don’t know what a shellac is. Some kind of waterproof varnish? I can only say get a few and test them out. Make sure they will stand up well to water and repeated washing down. If you could find the right finish, they would look glorious. Have you tried any type of spray on gloss/clear coat yet? 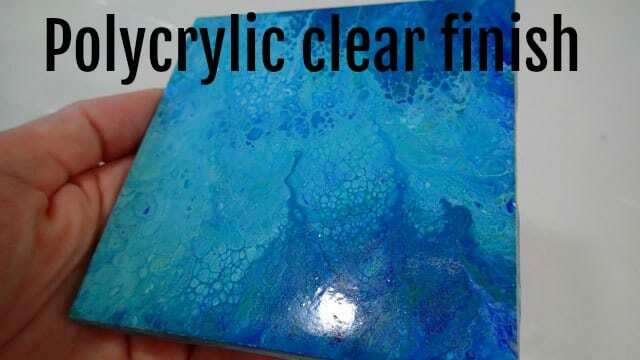 I just got some tiles to try pouring on, many of mine are on records as they are REALLY inexpensive & the Krylon Kamar looks really nice & so far been easy & fairly cost effective for the records & canvases I’ve done. I’ll shall try it on a tile & give it the tea cup test (& as well, run it thru the diswasher) & let you know the results. FYI- Did you know that when shaking a can of spray (whatever) if you hold it upside down & shake it both side to side & up & down at the same time you don’t have to shake it near as long? Just learned that one, thought I’d pass it on. I’m still sourcing some different products and have a few more curing waiting to test. I’ve heard the Kamar is good for paintings and have that on my must try list. Let me know how it works out for you. I use Minwax oil based varnish. After many years, nothing that I’ve used it on has ever yellowed. Can I use matte tiles for coasters instead of gloss?